The new set of battleground state polling from Mason-Dixon provides a terrific working example of what we call "house effects" -- a poll's consistent tendency to lean toward one candidate or another. Throughout this election cycle, we have found that Mason-Dixon's polls lean 2-3 points more toward John McCain than the average of other polls taken in those states at the same time. In all of these states but Florida, Mason-Dixon came in below our average (although in some cases not by much). On balance, their polls were 2.5 points more favorable to McCain than the average -- exactly where our model had pegged Mason-Dixon polls going in. But! -- you might protest -- maybe these numbers are more favorable to McCain because your averages are out of date, and this election is trending toward McCain! Well, not really. 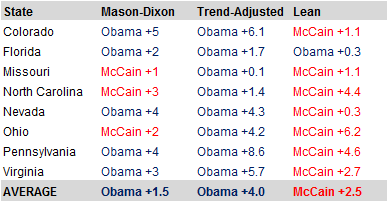 Because if you compare these polls against the last time Mason-Dixon was in the field in these states, Obama hasn't really lost any ground. (Actually, he's gained a bit, but not any statistically significant amount). ...to make this clear for the nth time, the presence of a house effect does not mean that a pollster is partisan or "biased". Mason-Dixon is a non-partisan pollster. Nor does it mean that a pollster is wrong! Mason-Dixon has a pretty good track record. Their vision of the electorate -- which seems to point toward a narrow Obama electoral victory -- could very easily turn out to be the right one. But it does mean that you need to take these sorts of things into account to make sure that you're making what you think are apples-to-apples comparisons.